My high school classmate Lisa just forwarded this photo that I thought might make ye socks chuckle. That's yours truly sitting in the front row. I don't remember the name of the girl sitting next to me (typical, right?!) But, I remember everybody else. 1st row (l to r) me, ?, Blenda Thomas, and Jay House. 2nd row (l to r) Elizabeth Greer, Mrs. McGaughey, Sharla Swinson, Rene McCain, and Lon Hillis. 3rd row (l to r) Tommy Franklin, Angie Morris, Rosie Llanas, Trish Arredondo, Christie King, and Norma Rios. Quit laughing so hard!! You were a goofy-lookin' teenager once!! Imagine my surprise to find a photo with me in it on the Internet! I happen to be the girl who's name you can't remember. Don't feel bad, the only people I remember in the picture are Mrs. McGaughey, Lon Hillis, Tommy Franklin, and Lisa Morris. :) To solve your mystery...I was Stephenie Schepers. May I ask your name? Take care! Hey, Stephenie! I remember you now. That is not a very good picture (of anyone)! I believe we were in Spanish Club together, too. Somewhere I've got another picture of you wearing a sombrero on the field trip we took down to San Antonio. I'll see if I can locate it for you! Oops, I just realized that I called Angie Morris "Lisa." I remember Lisa better since we were in the same grade. I also just realized that I am the only senior in that photo, so maybe that's part of the reason I could not remember everyone. Man, I feel old! 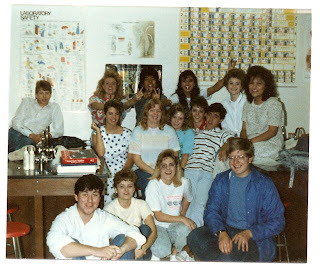 I have one photo from Mrs. McGaughey's class, and it is of Lon Hillis, Suzanne Vincent, and me dissecting pigs. Ugh! On another note, I have been perusing your blog, and I have thoroughly enjoyed reading it. You're a great writer! I also gather that you live in Florida. I married a military man 17 years ago, and we are now stationed in the Panhandle of Florida. I have many great memories of our Spanish trip. I have family that lives in San Antonio now; so every time we go to visit them, I walk down memory lane. The pigs were bad, but the sharks were worse for me . . . shivers down my spine just thinking about it! You should think about signing up at facebook.com. A ton of Frenship people are on there that you would know, including a few (like us) who have moved to Florida! Chris and Kristi Deason are in Casselberry, and Deidre King is down in the Tampa Bay area.